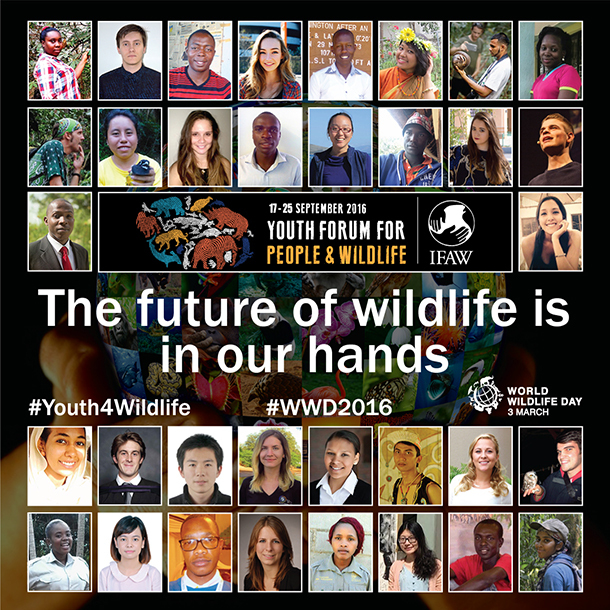 On World Wildlife Day, I am proud to announce an extraordinary group of 34 young people, ages 18-25, from around the world who have been selected as delegates for the Youth Forum for People and Wildlife. In September, the delegates will travel to Johannesburg, South Africa, where they will engage in skill building workshops, and explore conservation and wildlife welfare issues, including the impact of wildlife trade. They will convene just days before the 17th meeting of the Convention on International Trade in Endangered Species (CITES). But you can meet and talk with these incredibly talented and wonderfully diverse individuals now! The Youth Forum includes an online community that anyone can join. By registering at the Youth Forum site, people can engage with the delegates, network, and learn more about a range of issues, including these delegates' particular passions in animal welfare, conservation, wildlife trade and sustainable community development. Members of the online community will be able to engage with some of the live conference events as well. The 34 Youth Forum delegates were selected from nearly 1,000 applicants, and they exemplify a commitment in keeping with this year's World Wildlife Day theme: "The Future of Wildlife is in Our Hands." Delegates hail from 25 different countries and represent a diversity of backgrounds. In the coming months, we will share delegate stories and perspectives. In the meantime, we invite you to meet the delegates and join the conversation at www.ifaw.org/youthforum.